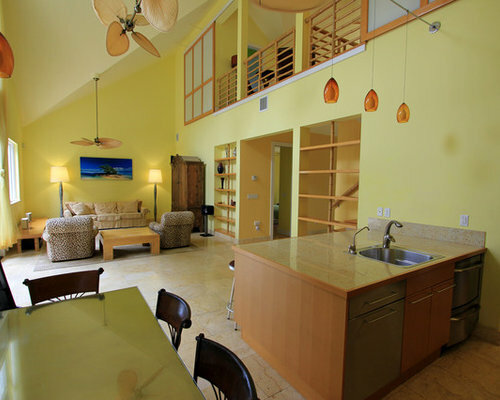 This concrete and wood-frame house is located in the Casa Marina district of Key West, FL. 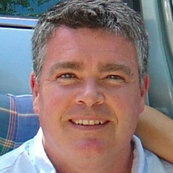 The existing structure was completely gutted and a new second floor and rear porch were added. A large double-height great room with expansive living area, kitchen, and built-in banquette dining now opens to a new swimming pool and fountain at the rear. 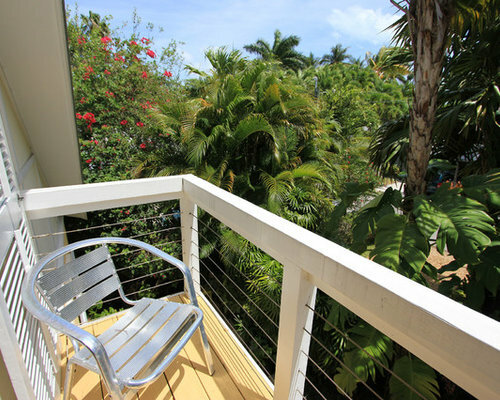 New bedrooms open porches, terraces, and lush tropical gardens at the front. A new second floor loft/guest bedroom overlooks the double-height great room, and a new balcony overlooks the front gardens. 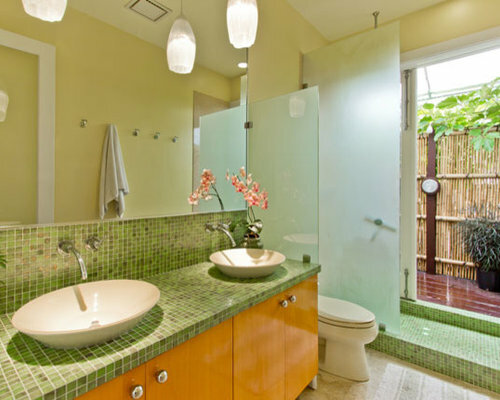 Materials include extensive use of travertine tile and bamboo to enhance the tropical theme and setting. A view of the front facade and enclosed front yard. 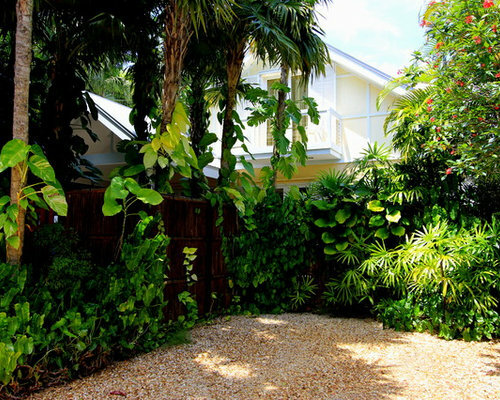 The yard is lushly landscaped with tropical planting and enclosed by a bamboo fence. A view of the lushly planted front yard and gold colored gravel parking area. A six foot high bamboo fence provides added privacy. The front porch can be seen to the left and a balcony with cable railing and double french doors can be seen above. A view of the entry gate through the front yard and on through the entire house towards the rear water fountain feature in the rear yard. A view from the entry illustrating the long axis through the entire house from the entry to the rear swimming pool water feature. 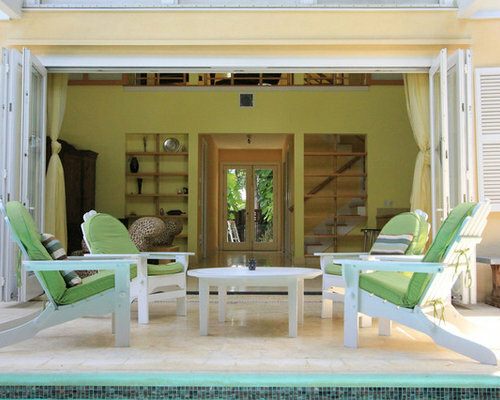 With the front double french doors open and the rear 18'-0" wide Nana bi-fold doors open, the house is truly entirely open to tropical indoor-outdoor living. 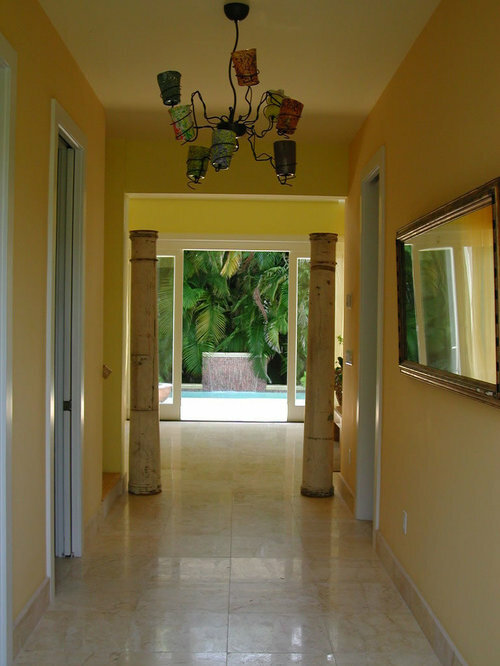 A view down the entry hall towards the great room and rear swimming pool terrace. The ceilings are 10'-0" high and doors are 8'-0" high, creating a sense of grandeur and formality. Antique wood columns and a gilded mirror also add to the character of the space. The swimming pool water feature with iridescent copper glass mosaic tiles can be seen in the far distance. 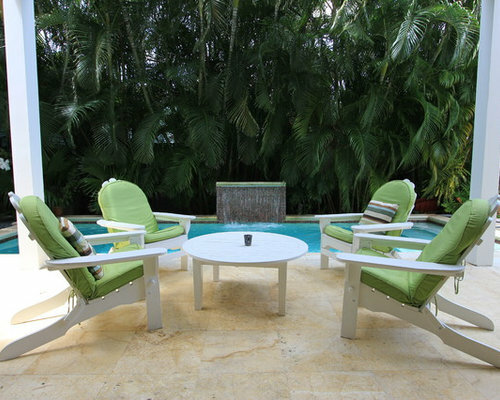 A covered porch overlooking the swimming pool and modern water feature is furnished with bright tropical-hued Adirondack chairs. The water feature is made of iridescent copper glass mosaic tiles, and a constant streaming sheet of water produces a soothing background sound. 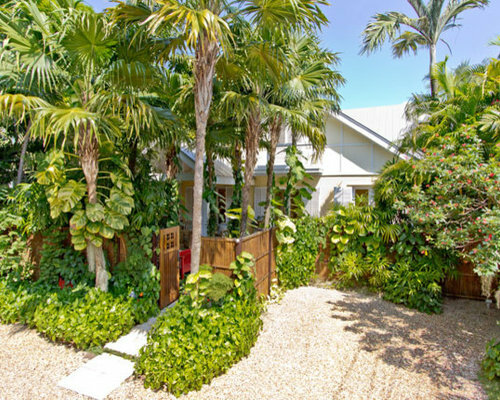 Lush planting of Areca palms provides complete privacy. 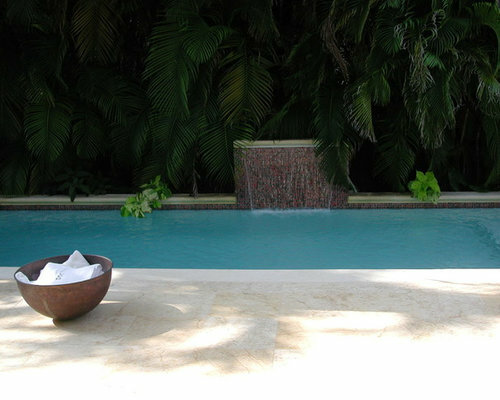 A view of the metallic copper glass mosaic tiled swimming pool fountain and coping. The terrace is tiled in large format 18 x 18 Jerusalem travertine stone. 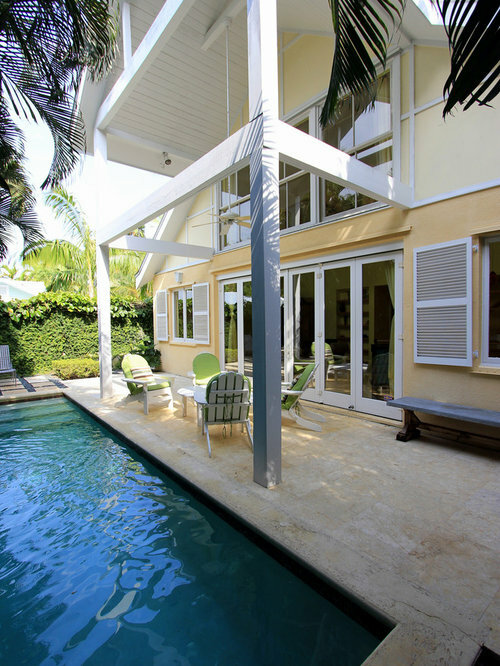 A complete view of the rear facade, including the swimming pool, covered terrace, and great room interior. The entry with french doors can be seen in far distance at the center. 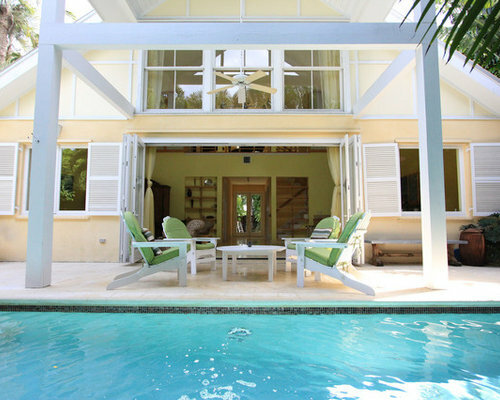 Tropical living in Key West with indoor outdoor living! An 18'-0" wide bi-fold Nana door fully opens to allow complete access from the double-height great room to the rear swimming pool terrace. Another view of the rear facade, covered porch, and swimming pool terrace. White windows, shutters, and trim contrast with warm colored yellow stucco and board and batten wood siding. 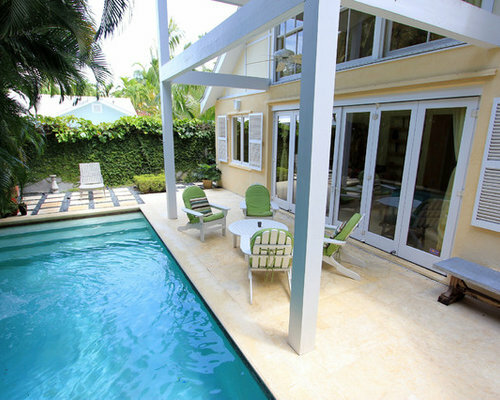 A view of the rear swimming pool, covered terrace, and sun terrace beyond. 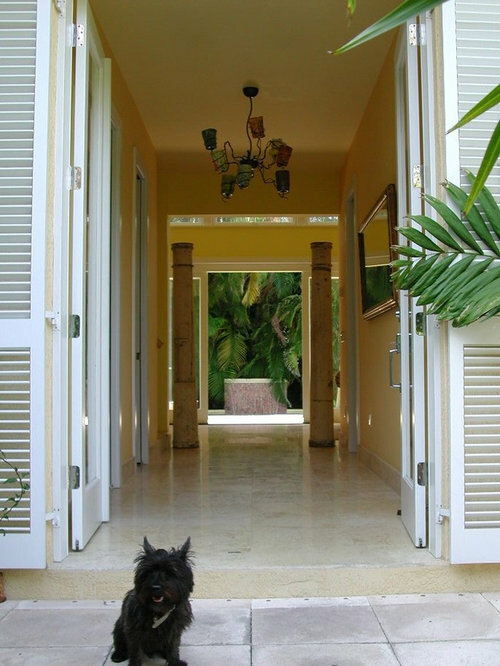 The bi-fold doors may be opened completely to provide a generous 18'-0" wide opening for true indoor outdoor living. 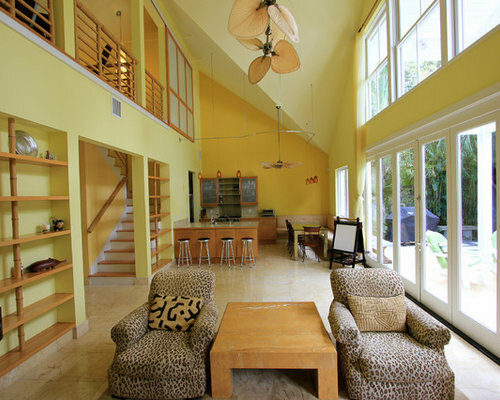 A warm colored double-height great room overlooks the rear swimming pool area. An open living area is furnished with leopard patterned upholstered club chairs. Built-in shelving and railings made of bamboo bring a distinct tropical flavor to the interior. Custom-made wood-framed panels slide to close off and provide privacy for the upstairs loft area. A view from the banquette seating area towards the living area. 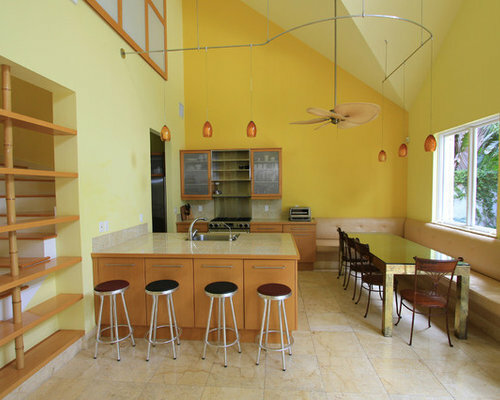 Glass pendant track lighting provides illumination in the kitchen and dining area. 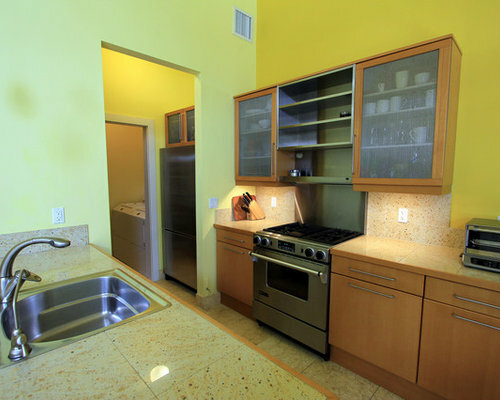 A view of the kitchen area showing the beech cabinets, stainless steel appliances, and pantry, and laundry room beyond. The countertops are made of terrazzo patterned porcelain tile trimmed in beech. 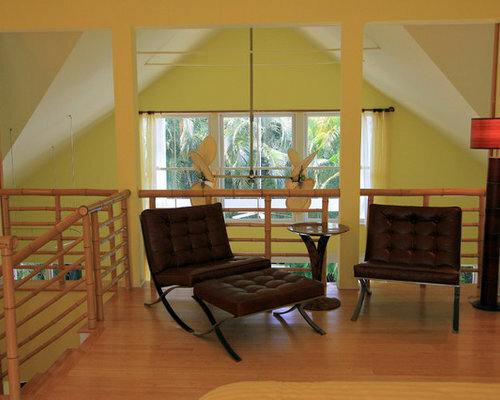 A view of the upstairs loft area overlooking the great room below. The room can also be closed off with sliding wood-framed frosted panels to function as a guest room. 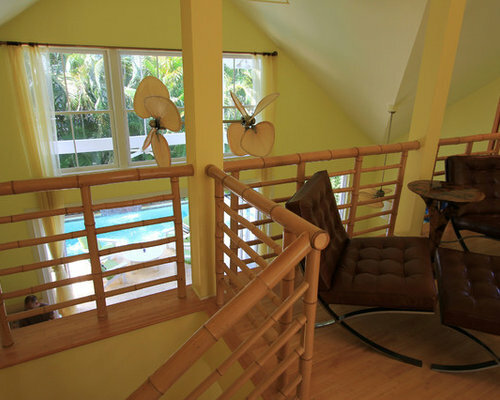 Bamboo railings and bamboo floors reinforce the tropical Key West theme. A view of the loft/guest bedroom, which overlooks the great room. Custom bamboo handrails provide protection, relate to the bamboo flooring, and enhance the tropical theme. Large sliding frosted glass panels may be closed when needed to provide privacy for use as a guest bedroom. A detail view of the custom bamboo handrails in the loft/guest bedroom e great room. 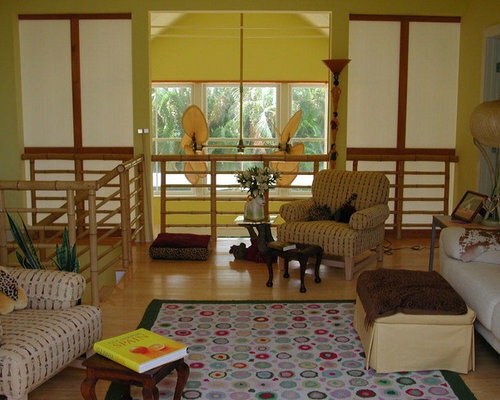 The handrails provide protection, relate to the bamboo flooring, and enhance the tropical theme. Large sliding frosted glass panels may be closed when needed to provide privacy for use as a guest bedroom. A view of the front covered porch adjacent to the entry. A six foot high bamboo fence encloses the entire front yard and provides privacy for this area. 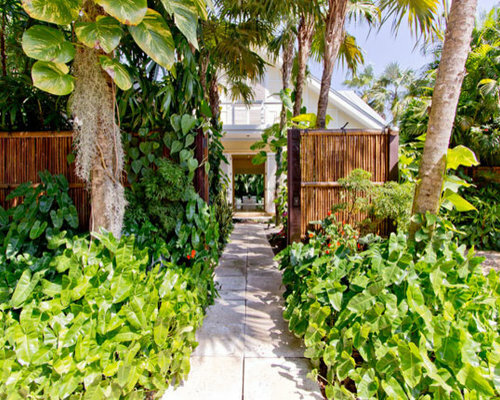 Rich tropical landscaping also enhances the setting. 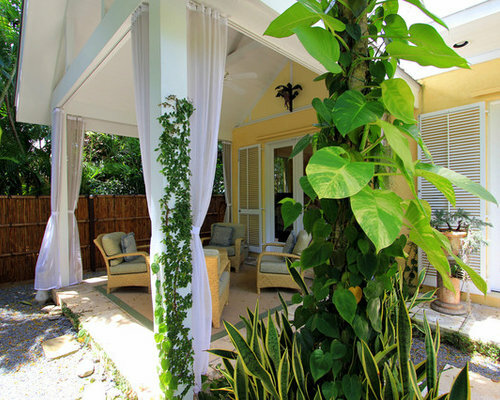 Full length curtains also can provide further privacy and protection for the outdoor furniture as needed.